QUESTION OF THE DAY: What Does the 'HBCU vs. PWI' Debate on Twitter Really Say About Us? If you are a follower of Black Twitter like I am then you know there is a raging debate going on after a tweet posted by user @Med_School12 went viral. Through her tweet, @Med_School12 basically implied that the curriculum at a rigorous PWI (aka predominantly white institution) is more difficult than that of an HBCU. Now being that I am a proud graduate of an HBCU, I don't feel the need to get into this debate. My resume speaks for itself so there is no reason for me to debate someone on her opinion on a subject she appears to have little knowledge about. Besides, debating someone who never attended an HBCU on the magnificence of an HBCU is like debating a blind person on the color of the sky. You really can't speak on something you've never experienced. The more pressing issue for me is what this continuing debate says about us as a people. Why do we feel it's necessary to have this debate at all? Why do we feel the need to denigrate each other's choices when it comes to our decisions concerning higher learning? What are we really trying to prove? I don't feel this debate is so much about HBCU vs. PWI but rather a more sinister issue going on with us as people. There are definitely some internal demons we still need to slay. A lot of us still suffer from a Black Inferiority Complex no matter how much we like to claim we have accomplished. This is not a debate about HBCUs, as always, it is a debate about Blackness and the carelessness with which we take ourselves for granted. HBCUs are seen as a joke because Black people are seen as a joke. We were to be slaves only, not serious people capable of anything worthy. White supremacy has always taught Black people to hate themselves and anything associated with themselves. HBCUs fall under that umbrella. It is a sad irony that HBCUs fought for Blacks to be seen as viable in higher education only to have Blacks at PWIs demean and deride them. We are Black people living in a society that teaches us to privilege Whiteness and, unfortunately, that is what most of us will do. Black people and Black culture is taken for granted, so it should come as no surprise that Black institutions are as well. It is not difficult to find Black people who take Black institutions for granted, Black culture for granted, and Black people for granted. We see clearly the degree to which white supremacy has inserted itself into Black life when privileging Blackness is up for debate. There are Black people who are disgusted by the idea of privileging Blackness. To celebrate their own is outrageous to them. We already know that White people, as a whole, are not going to privilege Blackness, so the question becomes if not us, who will? I would love to hear from you all. What do you re4ally think this debate says about us? 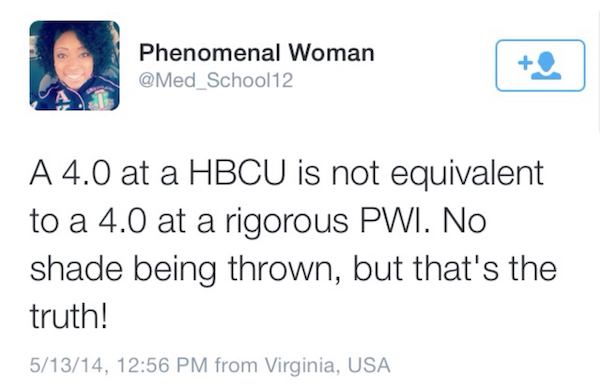 Dont get me started...really all this says is that some have bought into the myth that PWIs are better than HBCUs. Or that white is always better. How can they compare the rigor, if they didnt attend an HBCU? From an employet and grad school recruitment perspective, HBCUs attract the major players, especially those interested in a diverse work/school environment. Anyone who speaks in this manner is really looking for a way to appear "better than." If it werent through this misperception, they would figure out another way to puff themselves up. Who ever says this need be careful because the black college grads they encounter later on professionally as peers will likely be HBCU alumni, as HBCUs still produce more black college graduates. I imagine they wouldnt take too kindly to this notion. People are really still having this debate? One has to attend an HBCU in order to do a comparison. Bottom line.